TYRONE – Employees at the Moshannon Valley Correctional Center (MVCC) donated teddy bears to Tyrone Hospital to support the hospital’s pediatric patients. Tyrone Hospital will distribute the teddy bears to children who receive care in the emergency department, while supplies last. This year MVCC employees donated 118 teddy bears that were donated to five area hospitals during the Christmas holiday season. 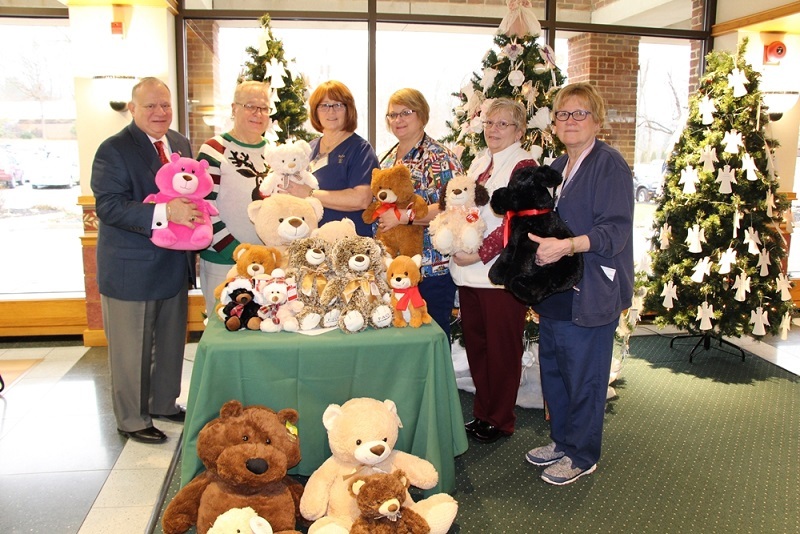 The employees of the MVCC donate teddy bears each year during the holiday season to area hospitals as a community service project to support area children undergoing medical care. Vicky Shaw, RN, Emergency Department manager, said the emergency department physicians and staff are very grateful for the donation from MVCC. Pictured are representatives of Moshannon Valley Correctional Center (MVCC) and Tyrone Hospital with the teddy bears that MVCC employees donated to Tyrone Hospital. From left to right are: Joseph Peluso, chief executive officer, Tyrone Regional Health Network/Tyrone Hospital, Edward G. Kushtos, human resource specialist at Moshannon Valley Correctional Center, Barb Stewart, RN of the emergency department, Tammy Hurley, RN of the emergency department, Beth Dietrick, RN, assistant director of nursing and Peggy Steward, RN, nursing supervisor.